Alopecia areata is a type of hair loss that occurs when your immune system mistakenly attacks hair follicles camera.gif, which is where hair growth begins. The damage to the follicle is usually not permanent. Experts do not know why the immune system attacks the follicles. Alopecia areata is most common in people younger than 20, but children and adults of any age may be affected. Women and men are affected equally. Alopecia areata is rare before the age of 3 years. There seems to be a significant to inherit the tendency to develop alopecia areata from ancestors. Alopecia areata is an acquired skin disease that can affect all hair-bearing skin and is characterized by localized areas of non-scarring hair loss. Alopecia areata is occasionally associated with any other external or internal medical problems. Most often these bald areas regrow their hair spontaneously. No correlation exists between the number of patches at onset and subsequent severity. Alopecia areata can affect any hair-bearing area, and more than one area can be affected at once. The most prominent symptom of alopecia areata is patchy hair loss. Coin-sized patches of hair begin to fall out, mainly from the scalp. Any site of hair growth may be affected, though, including the beard and eyelashes. The loss of hair can be sudden, developing in just a few days or over a period of a few weeks. There may be itching or burning in the area before hair loss. The hair follicles are not destroyed and so hair can re-grow if the inflammation of the follicles subsides. People who experience just a few patches of hair loss often have a spontaneous, full recovery without any form of treatment. About 30 percent of individuals who develop alopecia areata find that their condition either becomes more extensive or becomes a continuous cycle of hair loss and regrowth. About half of patients recover from alopecia areata within 1 year, but many will experience more than one episode. Around 10 percent of people will go on to develop alopecia totalis or alopecia universalis. Alopecia areata can also affect the fingernails and toenails, and sometimes these changes are the first sign that the condition is developing. 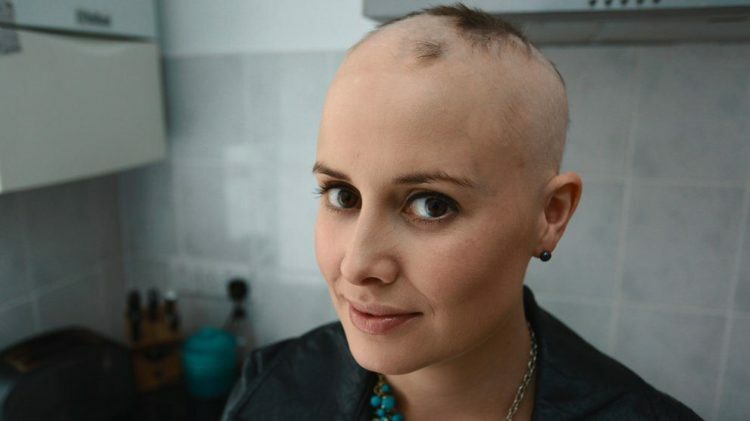 Alopecia affects both men and women equally. Exclamation mark hairs: This occurs when few short hairs that get narrower at their bottom and grow in or around the edges of bald spots. Cadaver hairs: This is where hairs break before reaching the skin surface. White hair: This may grow in areas affected by hair loss. A family history of alopecia areata and/or of other autoimmune conditions is present in 10–25% of patients. There is increased prevalence in patients with chromosomal disorders such as Down syndrome. While your genes are pretty much fixed from birth, alopecia areata tends to come and go, especially in the early stages. Alopecia areata usually begins when clumps of hair fall out, resulting in totally smooth, round hairless patches on the scalp or other areas of the body. In some cases the hair may become thinner without noticeable patches of baldness, or it may grow and break off, leaving short stubs (called “exclamation point” hair). In rare cases, complete loss of scalp hair and body hair occurs. The hair loss often comes and goes-hair will grow back over several months in one area but will fall out in another area. Alopecia areata is a common autoimmune disorder that commonly results in unpredictable hair loss. There is currently no cure for alopecia areata, although there are some forms of treatment that can be suggested by doctors to help hair re-grow more quickly. The most common form of alopecia areata treatment is the use of corticosteroids, powerful anti-inflammatory drugs that can suppress the immune system. These are mostly commonly administered through local injections, topical ointment application, or orally. The use of photochemotherapy is supported by some studies and presents a potential alternative for patients unable or unwilling to use systemic or invasive therapies. Use ointment inside the nose to keep membranes moist and to protect against organisms that are normally trapped by nostril hair. As such, any new developments in the treatment or prevention of either disease may have consequences for the other. There have been a handful of documented cases where treatment for alopecia areata using diphencyprone (DCP), a contact sensitizer, has led to the development of vitiligo. Preliminary research in animals has found that quercetin, a naturally occurring bioflavonoid found in fruits and vegetables, can protect against the development of alopecia areata and effectively treat existing hair loss. Further research is needed, including human clinical trials, before quercetin can be considered a treatment for alopecia areata. Your doctor will review your symptoms to determine if you have alopecia areata. They may be able to diagnose alopecia areata simply by looking at the extent of your hair loss and by examining a few hair samples under a microscope. Your doctor may also perform a scalp biopsy to rule out other conditions that cause hair loss, including fungal infections, such as tinea capitis. During a scalp biopsy, your doctor will remove a small piece of skin on your scalp for analysis. Blood tests might be done if other autoimmune conditions are suspected. The specific blood test performed depends on the particular disorder your doctor suspects. However, your doctor will likely test for the presence of one or more abnormal antibodies. If these autoantibodies are found in your blood, it usually means that you have an autoimmune disorder. As conventional treatments for alopecia are extremely limited, studies that support natural treatments for alopecia are even thinner on the ground. There are some people that recommend rubbing onion or garlic juice, cooled green tea, almond oil, rosemary oil, honey, or coconut milk into the scalp. While none of these are likely to cause harm, their effectiveness is also not supported by research. Some people turn to alternative treatment methods such as acupuncture and aromatherapy, although there is little, if any, evidence to support these treatments.